Vincent Hayes has been making waves in the roots and blues worlds ever since his 2010 debut release titled Reclamation earned him an him a 2011 Blues Music Award Nomination for Best New Artist. 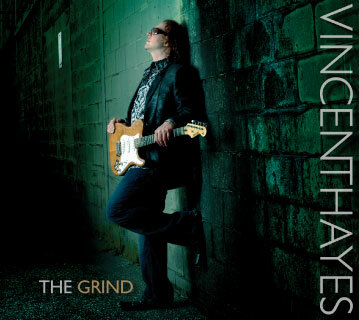 Though the “Vincent Hayes Project” moniker was shortened, Vincent comes out of the box swinging hard on his follow up disc, The Grind, released in August 2013 on North 61 Records. The Grind was produced and engineered by Bill Chrysler, and current sound engineer for John Mayer. Mastering was performed by Brian Lucey at Magic Garden Mastering (Black Keys, “Brothers/El Camino”). Although Hayes seems to be more of the genre of crossover blues/roots rock artists in the vein of Gary Clark Jr, Devon Allman or Derek Trucks, blues purists will be equally as pleased with the lyrically fun swing of “My Guitar And My Baby” and “Other Side of Town,” where Hayes proves that his fretwork and emotional delivery of slow minor blues is unmatched in today's crop of new blues guitarists. Additionally, his reputation as a world class showman have recently earned him invitations to open for B.B. King at the prestigious Frederik Meijer Gardens and as a co-headliner on a triple bill with Buddy Guy and Jonny Lang at the 2013 Coast West Music Festival in Michigan.